6 . How can I do If the products in my order are short of stock? How to calculate the replacement discount? please click here for more details. Step1:Login into your account, we will show you the orders which are on preparing. then click the button "Need to Select Replacement" to view the order which need to select replacement. After that, please click the button "View Order" for details. Step 2: You can select replacement or ship the ready to complete the order. For instance, If you want to select the replacement, please click the button "Select Replacement" for next step. Step 3: Then we will show you all of the short-of-stock items, you can select the similar replacements for next step. Step 4 : We will show you the short-of-stock sum, and provide the similar replacement items for your select, then click the button "Add". After that, please click the button "View & Checkout Replacement" for the next step. Or if you DO NOT need to select the similar items, you can click the button "Find in Stock" to select other in stock items or “Find in My Wish List” to select other items you like instead. Step 5: Here are two cases in this step. Case two:If the replacement items HAVE over the short-of-stock sum, we will show you the balance you need to pay. Then you can click button "Place order with replacement" to finish the replacement. After finished the replacement, your order will be ship out within 48 hours. Note: The above statement will not include the freight. 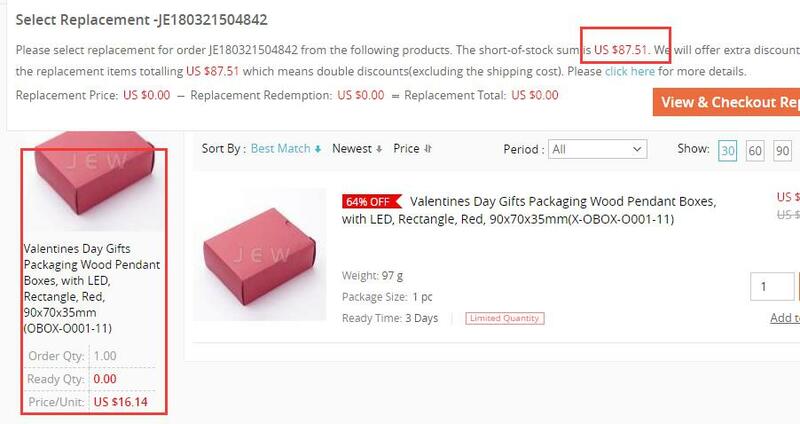 If the weight has changed after you make the replacement, our system will recount the shipping fee..
By the way, the discount of 30% is only for the value of goods.